You can use a skew transform to skew, or tilt, a user interface element in either the X or Y dimensions. You specify skew values separately in both X and Y dimensions, expressed as an angle. 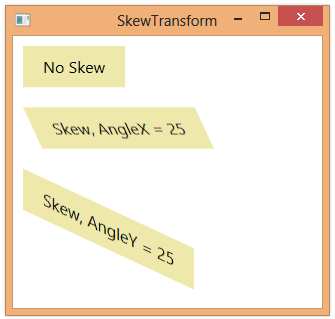 You specify a skew using a SkewTransform element, setting values for the AngleX and AngleY properties. Both properties default to a value of 0. Specifying a value for AngleX tilts an element’s vertical edges away from the Y axis. Specifying a value for AngleY tilts an element’s horizontal edges away from the X axis. <TextBlock Text="Skew, AngleX = 25" HorizontalAlignment="Left"
<TextBlock Text="Skew, AngleY = 25" HorizontalAlignment="Left"